Much of Lake County, Illinois was underwater from the insane storms that have been rolling through. Towns that haven’t ever seen floods suddenly saw themselves rescuing motorists from streets that turned into rivers. I think my old town is still underwater as well as many other places near bodies of water. My mum’s house doesn’t have a lake behind it...that’s a field, a pretty flat one at that. At its highest, the water almost crossed the property line. That hasn’t ever happened before. Some roads were underwater that were major routes. On those routes there were actually police officers directing traffic through the most shallow bits. Many side roads were just completely impassable or were a maze of danger. And the storm that brewed it. 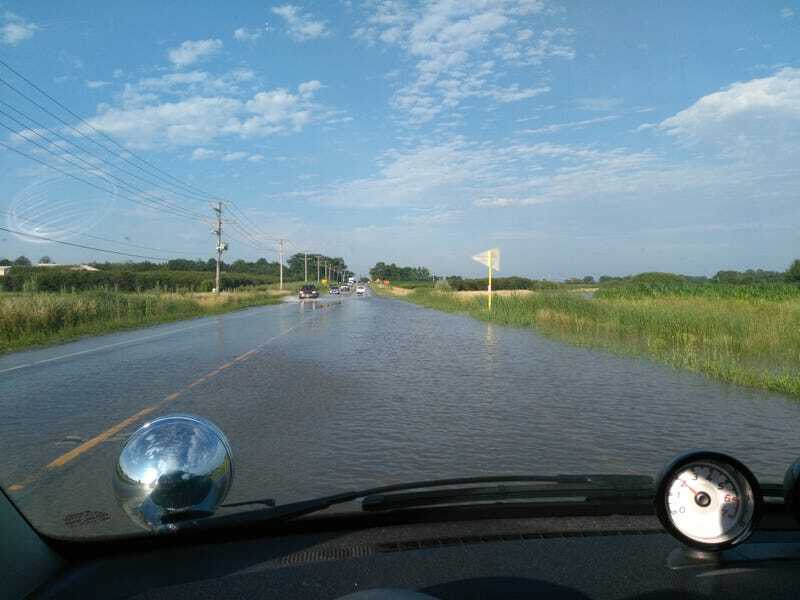 To get home from work, I had to do a deep water crossing. The water got to just a few inches under the intake. Thank heavens for good seals in a smart!! My parents and I spent the night bailing out the basement in their rental property. Apparently the window wells filled up with water, the glass broke from the pressure, and in came all the water. The sump pump couldn’t keep up.